There has been a suggestion there have been many suggestions in the Young Adult world that there’s too much paranormal (here at the Teen Blog we call it supernatural) going on, too many characters with superhuman motivations, strengths and failings, or too many thunderbolt-type interventions and whatnot. It’s all not very likely. If you’re sick of all that, or didn’t really like it in the first place, here are some writers who keep it real, and, amazingly, manage to produce some fine work with not a sparkle in sight. Read some realism this summer! Laurie Halse Anderson: widely well regarded, and a multi-award winner. She’s also written a couple of historical stories (Chains and Forge) for younger readers. Courtney Summers: how horrid can girls be? Quite. Walter Dean Myers: won the Printz Award for Monster, and author of over 70 books, which is quite staggering really. Sara Zarr: author of three thought-provoking novels about living with the consequences of the past, childhood friendship, and faith. John Green: slightly less grit, but still real, and a champion of the geek (google “nerdfighters”). Melina Marchetta: although she’s written one fantasy novel (Finnikin of the Rock (we’re not saying you should avoid it of course)), she’s best known for books like On the Jellicoe Road, which won the Printz Award last year. Chris Crutcher: his books cover issues as wide ranging as prejudice, abuse, disability and poverty, with a realistic voice that has won him lots of fans. E R Frank: is a clinical social worker who specialises in trauma, so it is unsurprising that she puts her characters through a really tough time in her books. Todd Strasser: author of such varied works as The Wave (made into a movie in 2008), Wish You Were Dead (the first of a new thriller series) and Give a Boy a Gun. Close to Home: New Zealand authors like to mix it up a bit, and there have been some excellent novels in the last while, for example (just the four for now) End of the Alphabet by Fleur Beale (Ruby Yarrow’s always called at the end of the school roll, but this doesn’t have to translate to a life of always coming last), The 10 pm Question by Kate De Goldi (life is a real worry), Violence 101 by Denis Wright (try this one for an unlikeable but compelling protagonist! ), or About Griffen’s Heart by Tina Shaw (Griffen’s heart features both literally (he needs heart surgery) and metaphorically). There are heaps more of course – look for the Koru sticker on the book spine, the New Zealand books display, or your nearest friendly library staff member. Freak Magnet, Andrew Auseon – from the perspective of both the freak and the magnet, can they possibly become friends, or will Charlie become another entry in Gloria’s Freak Folio? “Draws both blood and laughter,” said the ALA Booklist. Geek Magnet, Kieran Scott – KJ has geeks racing after her, but sadly not the hottest guy in school. Can she, under the tutelage of the queen popular bee, freeze out the geeks and attract *Cameron*? Will she want to, when all’s said and done? “Magnet” looks like a typo now. Merry Christmas and a happy New Year to all our readers! Thank you for stopping by this year, hope you’ve enjoyed reading our posts as much as we have enjoyed writing them. 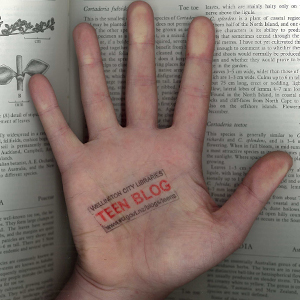 Most of us at Teen Blog Towers are going to be away until early next year, so unfortunately there won’t be much new content for a little while =( but the library will be open on these days =) so you won’t be too bored, right? See you next year! At the end of every year, every single website is contractually obligated by the internet to publish a list of their top ten albums released that year. Not wanting to void our contract and, let’s be honest, because it’s fun too, here’s ours. The rules are that it must have been both released and catalogued into the YA collection in 2010. Local goodness from Liam Finn, Connan Mockasin and pals. Felt like this one flew under the radar a little bit, undeservedly so. The best of the lo-fi indie girl band bunch in a year that said bunch was of a ubiquitously high quality. My favourite NZ release of the year. It’s a psychedelic pop gem. Apparently this is the last album from Damon Albarn’s cartoon band. If so, it was a great one to go out on. The noisiest and most “punk rock” electro band returned with their second and it stayed on my ipod all year long. Do greatest hits albums qualify for lists like this? Seeing as it’s my list, I’d say yes. More so because this is some of the best indie rock ever made. Ever. This album not only features the best use og guitar and drums this year, but also the cover features the best use of Cooper Black. Pretty much the perfect electro album. Which is more than enough to qualify for album of the year. So there you go. Agree? Disagree? Let us know in the comments section. Perhaps write your own, discussion generating list? Boys, Bears, and a Serious Pair of Hiking Boots, Abby McDonald – a story about balancing idealism with realism (read the new books post for a slightly less brief summary), described by the Publisher Weekly review as a “fun summer read.” Good thing it’s summer. Two Parties, One Tux, and a Very Short Film About The Grapes of Wrath, Steve Goldman – sort of like complete ridiculousness at an American high school as senior Mitchell navigates (stumbles) his way through teacher, student, friend, girlfriend, prom politics, with really funny results that are sometimes so horrendous it’s a shame you can’t read with your eyes closed. It has haiku chapter subtitles which obviously we approve of. Long titles say “witty”, not angsty. For example like The Secret Diary of Adrian Mole Aged 13 3/4, or I Lost My Mobile at the Mall: Teenager on the Edge of Technological Breakdown. Randomly, there’s also the groundbreaking Tristram Shandy or more lengthily The Life and Opinions of Tristram Shandy, Gentleman by Laurence Sterne (an 18th century postmodern epic, it’s a challenge). Or something. So if you’re writing the next great novel of wit, consider a longer, story-telling title. Revolution, Jennifer Donnelly (472 pages) – Andi, musical genius, New Yorker, sullen pillar of her falling apart family, unwillingly goes to Paris to get her educational life back together. While researching a relatively obscure 18th century French composer for guitar (like, you know, I hadn’t heard of him) she stumbles across the diary of Alexandrine, who may have been the companion of Louis-Charles (son of Marie Antoinette) in his last days, with whom she has a strange connection. Music students and fans may particularly get something out of this, as will people who like Courtney Summers. First sentences: Those who can, do. Those who can’t, deejay. The Abused Werewolf Rescue Group, Catherine Jinks (380 pages) – to think that five years ago nobody knew that “lycanthrope” was a word. This must surely be a companion to the popular Reformed Vampire Support Group? Toby discovers he has a rare and dangerous condition, and is adopted by an oddball group of people, keen to help him. First sentences: You’ve probably heard of me. I’m the guy they found in a dingo pen at Featherdale Wildlife Park. Extraordinary, Nancy Werlin (390 pages) – the follow up to Impossible. Phoebe is drawn to the mysterious Mallory and her brother Ryland, which may be a very bad thing for Phoebe, as they expect her to pay an “age old debt”. First sentence: Phoebe Gutle Rothschild met Mallory Tolliver in seventh grade, during the second week of the new school year, in homeroom. Boys, Bears, and a Serious Pair of Hiking Boots, Abby McDonald (293 pages) – Jenna is an urban environmentalist who has the opportunity to spend the summer with her hippie godmother in rural parts, where her urban environmentalism comes up against the locals’ pragmatic ruralism. Plus there’s romance maybe. Everlasting, Angie Frazier (329 pages) – In the 19th century Camille must choose between marrying rich and securing her and her father’s future, or the high seas on her father’s ship, even if this means a storm in the Tasman (!) Sea (bad) and Oscar, a “handsome young sailor” (good). But wait, there’s more: a quest through the Australian outback for an enchanted stone, murder, lies and intrigue. Action-packed adventure. First sentence: Camille clicked the latches down on her trunk and glanced out her bedroom window. Life, After, Sarah Darer Littman (278 pages) – Dani’s life in Argentina is blown to bits after a terrorist attack kills her aunt. Moving to the United States means a fresh start, although also troubles like speaking a different language, being a stranger, until she meets some new friends that help her pick up the pieces. First sentence: Normal kids were happy when the bell rang at the end of the school day. Love Drugged, James Klise (304 pages) – Jamie is semi-outed at school and does all he can to push the rabbit back into the hat, including taking drugs that will “cure” him and dating the most beautiful girl in school. But is it possible to live a life that’s basically a whole bunch of lies (and side-effects)? First sentence: Judging by the angry mail we get, a lot of people consider me to be the villain of this story. The Sorcerer of Sainte Felice, Ann Finnin (353 pages) – set in 15th Century France, Michael de Lorraine is rescued from execution and given refuge at a Benedictine monastery which, he discovers, contains “renegade monk-sorcerers” (how fab is that?) and a secret that could spell the end for the Abbot who rescued him. Oh, and the church (but not the renegade monk-sorcerers) still wants him dead. First sentences: I was only an apprentice. I swear it. 13 to Life, Shannon Delany (308 pages) – Small time life has changed irrevocably for Jessie after the death of her mother, and then there’s the hot new stranger with the cool accent and a teeny little dangerous secret which the Library of Congress Cataloguing-in-Publication Data, like, totally gives away (don’t read the copyright info). First sentence: Rio stiffened beneath my touch, striking a glossy hoof against the floor. Boys Don’t Cry, Malorie Blackman (302 pages) – When the doorbell rings Dante expects the postie with his university exam results, not his ex-girlfriend with his baby. Paranormalcy, Kiersten White (335 pages) – Evie lives in a world populated with every supernatural being you can imagine, and she can see through their glamours. Trouble is, she can also dream prophetic dreams, and she fears she’s responsible for the recent spate of unexplained paranormal deaths. The Space Between Trees, Katie Williams (274 pages) – Evie (again! – different Evie) is in the wrong place at the wrong time when the body of her childhood playmate is discovered, which leads to lies, a hunt for the killer, and danger. Cool cover. First sentence: I’m in Hokepe Woods this morning, like I am every Sunday, delivering papers and keeping an eye out for Jonah Luks. How They Met and Other Stories, David Levithan (244 pages) – Love in all its guises is explored in 18 stories by bestselling author (Boy Meets Boy, Nick and Norah…) and much successful editor, David Levithan. First sentence (‘Starbucks Boy’) – It was my aunt who pimped me out. First sentence: Marymount Manhattan is a small cosy college on the East Side of New York. My Name is Mina, David Almond (300 pages) – the prequel to the classic Skellig, in which you are privy to Mina’s journal, before she meets Skellig and Michael. Marcus Sedgwick (My Swordhand is Singing) loved it. Indeed, in the Guardian (again) he said, “My Name Is Mina is a wonderful book in its own right, perhaps an even better one than Skellig. It is joyous. Thank you, David Almond; I cannot remember when a book last filled me with such claminosity.” Claminosity sounds like fun. First sentence: My name is Mina and I love the night. The Chamber of Shadows, Justin Richards (419 pages) – more from Eddie, George, Liz and Sir William in another horror murder mystery (so much more horrific when set in 19th Century London). Possession, Chris Humphreys (360 pages) – book three in the Runestone saga. Entice, Carrie Jones (January 2011) – Zara has been kissed by pixie king Astley (cue Rick Astley music video*), plus Nick’s dead but there’s a chance she can save him, if Astley’s willing to help. Grey Wolves, Robert Muchamore (Henderson’s Boys, February 2011) – the grey wolves are German U-boats that caused massive problems for the British navy in the North Atlantic. What is needed is teen spies to saboutage them in the way that only teen spies can. Like Battleship, but with espionage. Angel, James Patterson (Maximum Ride, February 2011) – Max and Fang’s flocks must combine to defeat a doomsday cult threatening to kill all humans, but will Max be distracted by the idea that Dylan is Mr Right (as the scientists suggest)? If the title is anything to go by, Angel might be important. Darkest Mercy, Melissa Marr (March 2011) – [mild spoiler alert] will Irial really die? Surely not. Read and find out if Melissa Marr is game enough to kill of her coolest character. City of Fallen Angels, Cassandra Clare (April 2011) – Clary and Jace are back, and not a moment too soon, Clary and Jace fans say. This will be the fourth in the Mortal Instruments series from the prolific keyboard of Ms Clare. Invincible, Sherrilyn Kenyon, (Chronicles of Nick, April 2011) – Nick Gautier’s life continues to become more complex and dangerous in paranormal New Orleans. * Sorry, but you really can’t beat a good Rick Astley video. The teen blog likes Rick Astley videos, as does the WCL teen facebook page. Here are a lot of new magazines! I won’t bother writing about the contents of each, as usual, since (let’s face it!) you know what you’re getting with most of them.